The item you are viewing is an amazing Under Vehicle Search Mirror with Wheels. This equipment has many special characteristics. The owing of the castle wheel design makes it to move the mirrors easily for searching. The mirror is a 12" convex acrylic mirror, which is high strength shatterproof and has only half weight of the ordinary size glass mirror. This mirror is bright and not easy to break and can efficiently prevent the collision damage to itself. Besides this Under Vehicle Search Mirror is equipped with adjustable swivel for infinite adjustment and adjustable torch mount to have the idea light source, which will bring you a lot of convenience. 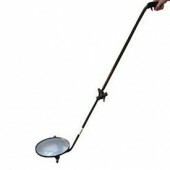 Another special aspect is the lightweight adjustable handle, which is with black foam cotton and owns good grip. 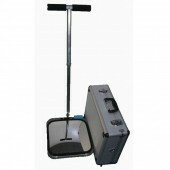 And the handle has two types, one type is easy to coordinate and search on the ground, while the other is an ergonomically designed handle and suitable for light raised searching task. And the overall material of the product accords with the ROHS process standard, so there is no need to worry about the material safety. Then where to buy such a good device? Go ahead, come here you will find the high quality product at best price and add one to your chart. Thanks for your clerks' thoughtful service. It is really a happy purchasing experience for me. I am very satisfied with the product. I have bought it for a long time, it still works very well and really bring convenience to my life. The quality of the product is very good, and it is not that expensive. Arrived right when they said it would, i was very pleased with the shipping process.